I have a few photos that I found in an envelope tucked away in one of my photo albums. The only information I have written on the envelope is, "The Arizona Fairgrounds." And were cut from a magazine, but what magazine I don't remember. I did not note anything about USAC on the envelope. As my memory tends to ebb and flow, I do remember that Jerry Unser was the 1957 USAC Stock Car National Champion; and advertised on the left rear fender of his #92 Ford is NAT'L STOCK CAR CHAMP. So it must be USAC. So I'll just leave it at 1957. It does look like a dirt track. The quality of the photos is not HD they are scanned and look passable, some have spots on them. I'll add them one at time. Jerry Unser, #92, 1957 Ford, Fenton Special. Thomas, Jerry Unser was the 1957 champion, with Ralph Moody second and Sam Hanks third. The USAC Stock Car Division ran at the Arizona State Fairgrounds in Phoenix on January 20, 1957, with the race won by Jimmy Bryan in a 1957 Mercury. I can't find complete results. They raced there the next time on February 9, 1958, with Bryan winning again in a 1957 Mercury and Jerry Unser running second in a 1957 Ford. I'd say the photo is from that race since it has the championship noted on it. Les Snow ran third that day, followed by Troy Ruttman and Cotton Farmer. They ran there again on February 5, 1961, calling it the Jimmy Bryan Memorial, and the winner was Paul Goldsmith - probably in a Ray Nichels-prepared Pontiac. Bring on the rest of those photos. See there was time when cars had class and character. From the few photos I have, here is Les Snow in his #8 1957 Chevrolet, it is in Bel Air or 210 trim rather than the 150 Utility Sedan style. I'm not sure if USAC allowed fuel injection or not. What a great photo from a great time period of stock car racing. Yes, it is. I'm really happy to see that one. I was in the service from 1956 until June of 1960. Later in the 60s, when I was flagging for MARC and then ARCA, Les was a friend. Keep 'em coming Thomas. I don't know about the fuel injection for certain, but I'm told that the Fords and Mercurys in 1957 were equipped with a Paxton supercharger, so I'd guess the Chevies had injection. From the same few photos, I think that this Al "Cotton" Farmer #18 1956 Ford, looks like a Mainline business sedan. From the same few photos, there is a separate note that states, "Unser 81" and "Crawford 82". Might this be Bobby Unser (?) in the 1956 Mercury, and Ray Crawford (?) in the 1957 Chevrolet, which looks like it could have used some rub rails. From the same few photos, I'm not sure about this car, it's from the group photos. #98 1957 Ford Business sedan, the driver is Troy Ruttman. I saw Troy Ruttman in Aggies #98 at Indy in 1952. Here is the finishing order to the Jimmy Bryant Memorial as posted on ultimateracinghistory.com. 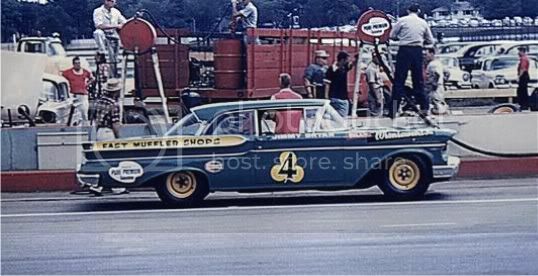 As a personal note My grandfather Bill Smith finished 29th in a 1960 Ford Starliner. Notes: Some reports place Hutcherson third and Musgrave fourth.